This week we released the Unicorn Horn appliance. It comes with a thin flap around the edge that allows you to easily apply it to your forehead. This can be blended in with make-up, or if you want it completely seamless, you could used pros-aide cream and make up to get a professional blend. There is another way, which Sara came up with, that allows you to wear your unicorn horn with no blending at all. 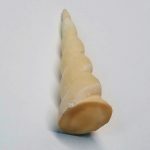 Much like our resin horns, which are solid and therefore need no flaps to adhere, this article will show you how to add a bottom to the latex horn. To do this, you will need our unicorn horn plus a bottle of our Flesh Latex. First you will cut off the flap around the edge of the horn so all that is left is the horn itself. Next find a flat surface that is absorbent. Plaster works best, but wood or polished cement would also work. Do not do this on anything that you don’t want stained. 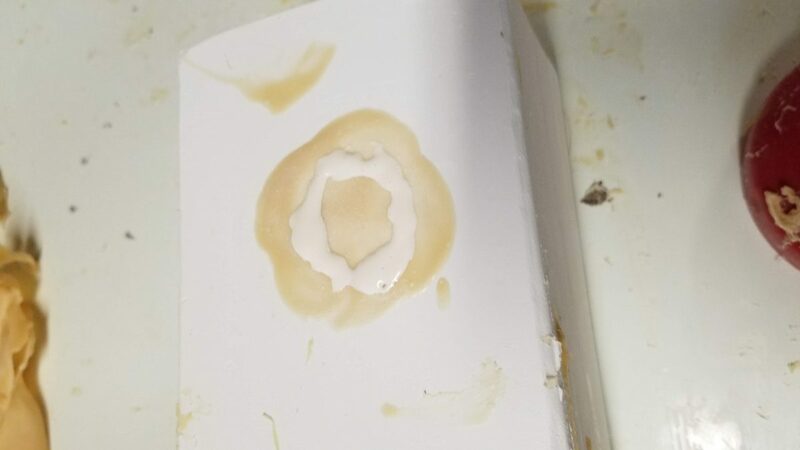 Latex doesn’t often stain (Though it will adhere to cloth and never come off), we just caution you to only do this on surfaces where it would be ok if the ammonia and water from our latex might leave a slight discoloration behind. Since we have so much plaster at the studio, we used that. Drip down some latex in a circle larger than the hollow end of the unicorn horn. You can use your finger to pat it out so its not too thick. Once that has dried, put another layer on, which will give the horn a stronger base. Coat the latex with a little baby powder. 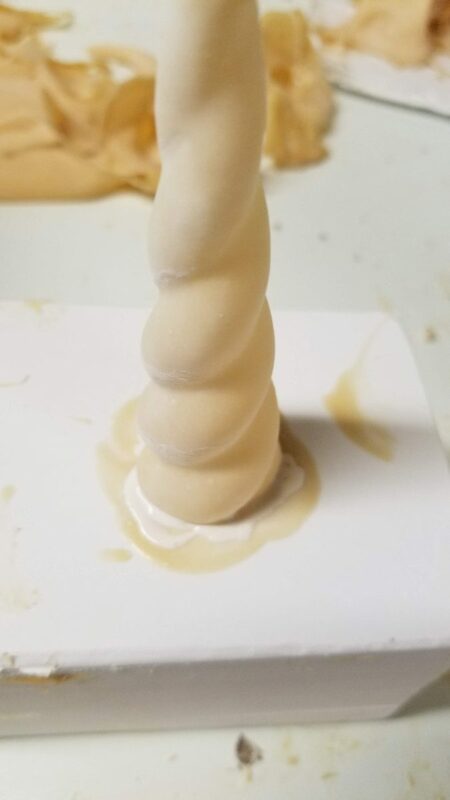 Dry latex sticks to itself, so putting powder on will stop the base from getting stuck to itself after we are done attaching the horn. Brush off most of the powder. 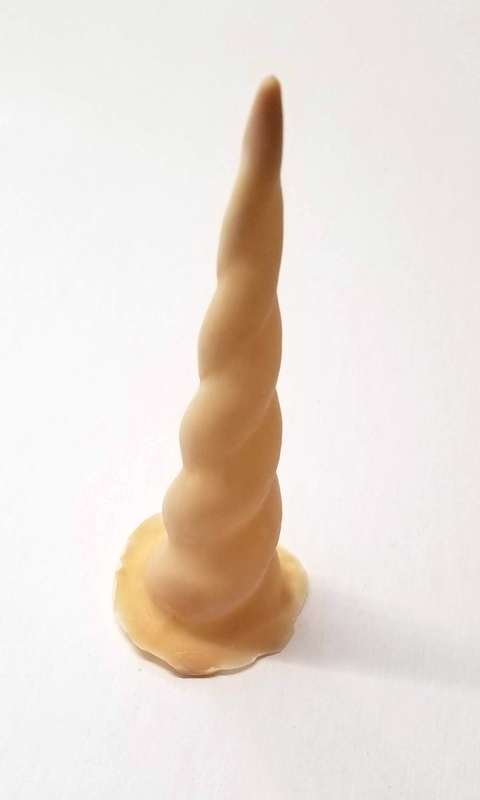 Put down another layer of latex, but this time only in a circle the size of the base of the unicorn horn. 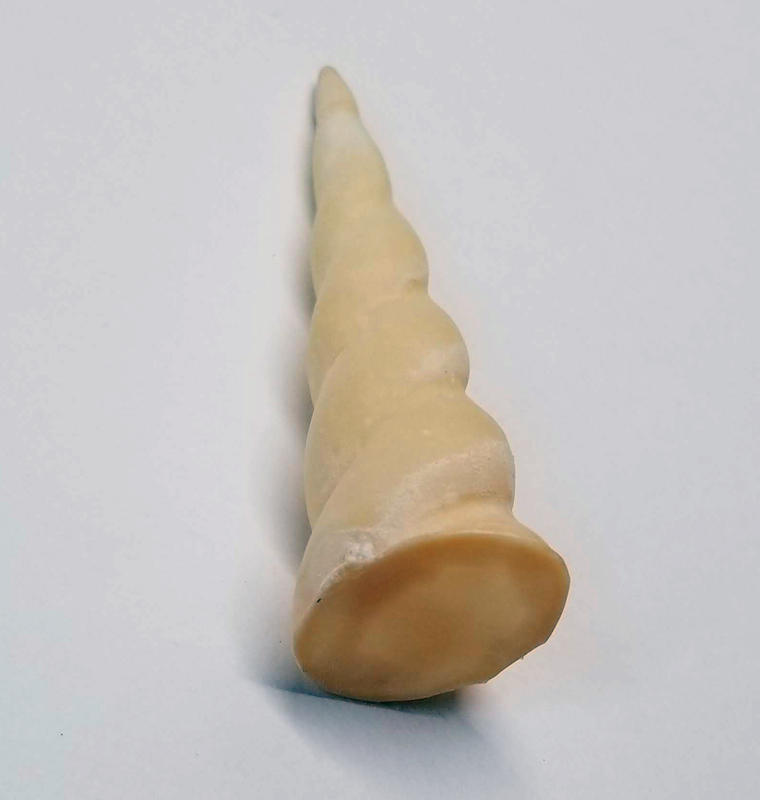 Next put the hollow base of the unicorn horn into the wet latex. Allow this to dry overnight. After it has dried, slowly peel the base and horn off the flat surface. A little baby powder on the bottom will stop it from sticking to itself. Take some scissors and trim the excess off so the horn has no flap hanging out past the base. Are there holes anywhere at the seam? No problem, just take a tooth pick, dip it in latex, and dab it on any holes and let it dry. Now you have a unicorn horn with a base that can be directly glued onto your forehead and best of all, it needs no blending now!